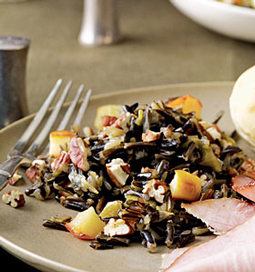 Wild Rice with Apples - A recipe from Savor California, the online showcase for extraordinary gourmet foods and beverages from California. Photo by Anna Williams Photography. Add apple and sauté 7 minutes or until tender and lightly browned. Remove from pan. Reduce heat to medium. Melt remaining 1 tablespoon butter in pan. Add leek. Cook 5 minutes or until tender, stirring occasionally. Add garlic. Cook 30 seconds, stirring occasionally. Stir in broth, 2 cups water, cider, and thyme. Bring to a boil. Stir in rice, reduce heat, and simmer 55 minutes or until liquid is absorbed. Drain and discard excess liquid. Return rice mixture to pan over medium heat. Stir in apple, pecans, salt, and pepper; cook 2 minutes or until thoroughly heated.